Pulse Creative Marketing is a full service marketing agency offering Strategic Marketing, Design & Print, PR and Digital Marketing solutions. Game of Thrones star, Ben Crompton presents Portfolio Business Award to Paul Finch of Pulse Creative Marketing. In October this year Pulse Creative Marketing were honoured to receive the Creative Industries Award at the Sunderland Echo Business Portfolio Awards held at the Stadium of Light. 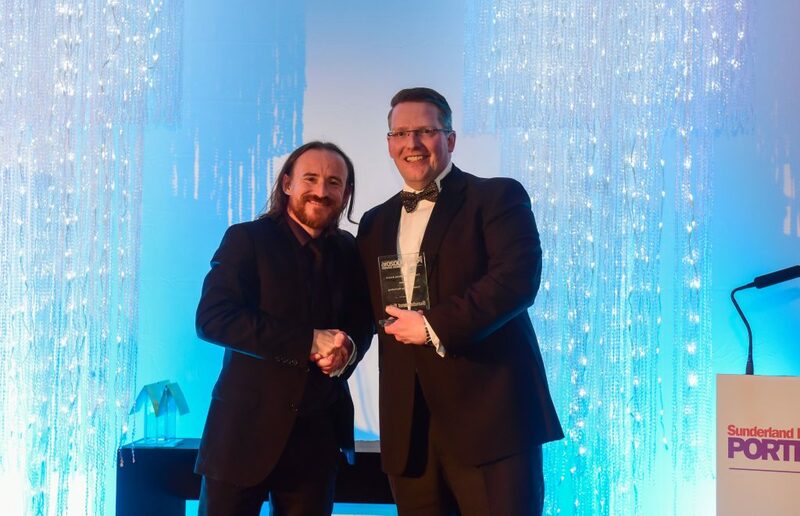 Ben Crompton, who plays Eddison Tollett in the Game of Thrones presented the award to Paul Finch of Pulse Creative Marketing. Pulse is a marketing agency offering strategic marketing, design and print, PR and digital marketing solutions. They are extremely focussed on providing exceptional service and by combining the power of great design with creative, intelligent thinking produce effective solutions that get results. In addition to working with a variety of clients in a range of sectors, Pulse has supported a number of students from the University of Sunderland, including three in the last 12 months alone. The Judges praised Pulse for being exactly the sort of firm that is needed and wanted in Sunderland and therefore deserved to win.